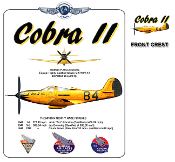 Cobra II was a post-war racing P-39 Airacobra that raced at the Cleveland National Air Races in the late 1940s. One-sided design has large image on front, nothing on the back. Available as a T-shirt or a Sweatshirt. Available in White, Natural and Ash Grey.